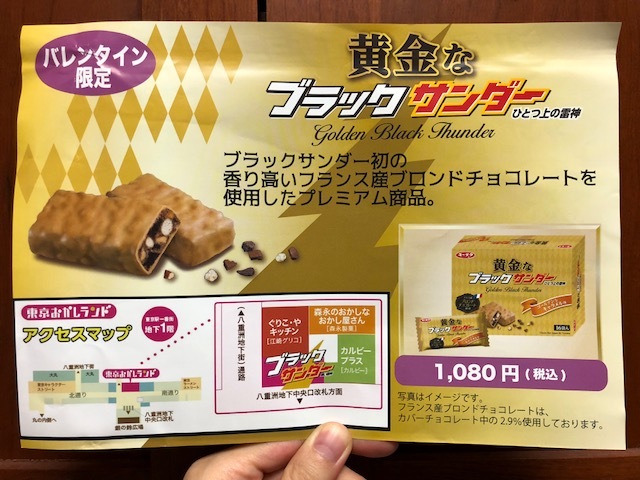 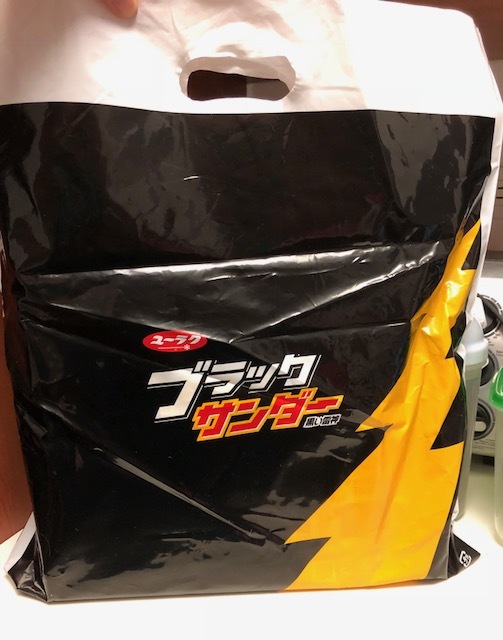 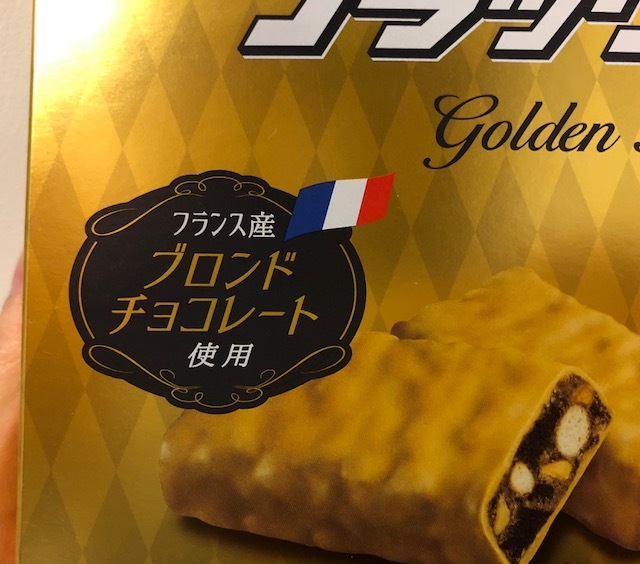 At Tokyo station, they have a special pop-up store of Black Thunder called "Giri Choco Shop (義理チョコショップ)" from January 12 through February 14, 2018. 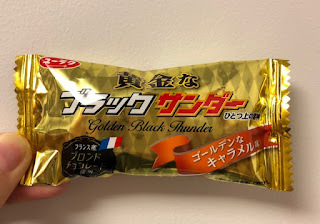 Black Thunder is a cheap chocolate bar (30 yen for regular flavor) and this special store is for Valentine's Day promotion. 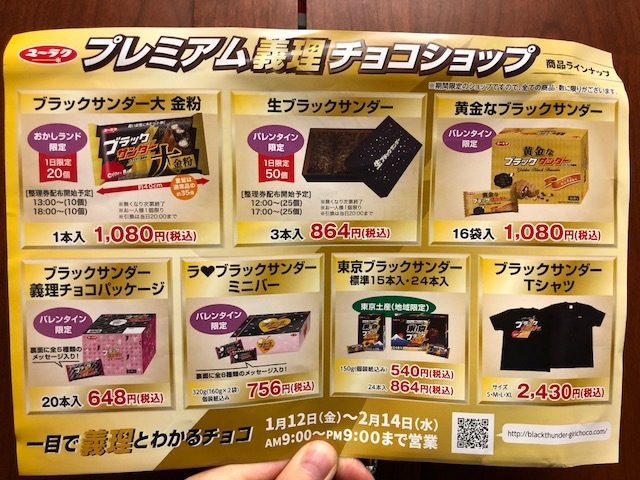 In Japan, Valentine's Day is to "give chocolate from female to a man you like" but also there's a Giri Choco tradition, which is an Obligation Chocolate, to give inexpensive chocolate to someone you don't have romantic feeling but just as a casual gift. 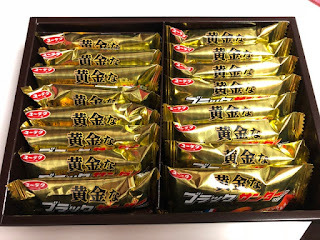 And on White Day (March 14th), men give back some sweets to females in return, and I feel like they tend to give more expensive confectionery to females, including for the Giri Choco givers, from my experience. Thus, Black Thunder is so cheap that it's perfect for Giri Choco, and the ad-line at this seasonal shop is even "Obviously Giri Choco in one glance." 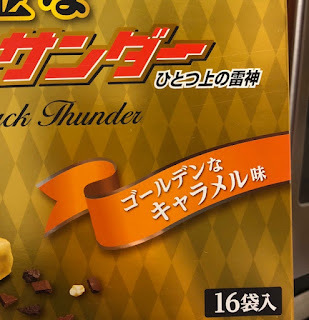 There're special Black Thunder chocolates and my husband took photos of the displays. A leaflet of Premium Giri Choco Shop. 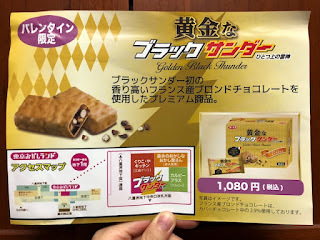 Black Thunder Large Gold Leaf (20 pieces per day, need a numbered ticket), Nama Black Thunder --- Nama, 生 means fresh or raw, but this case, I think it's like ganache --- (50 pieces per day, need a numbered ticket), Golden Black Thunder, Black Thunder Giri Choco Package, L♥ve Black Thunder Mini Bar, Tokyo Black Thunder, Black Thunder T shirts are available. 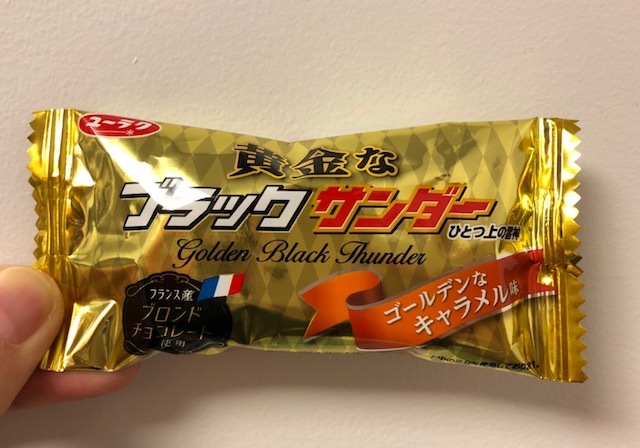 2.9% of the cover chocolate is Blonde Chocolate from France. 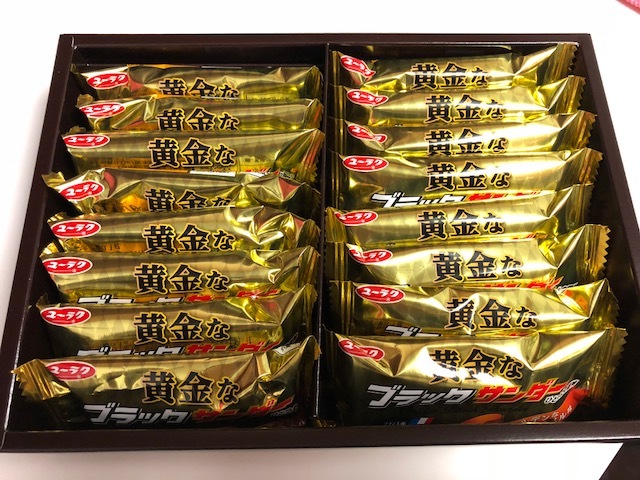 There're 16 individual pouches inside. 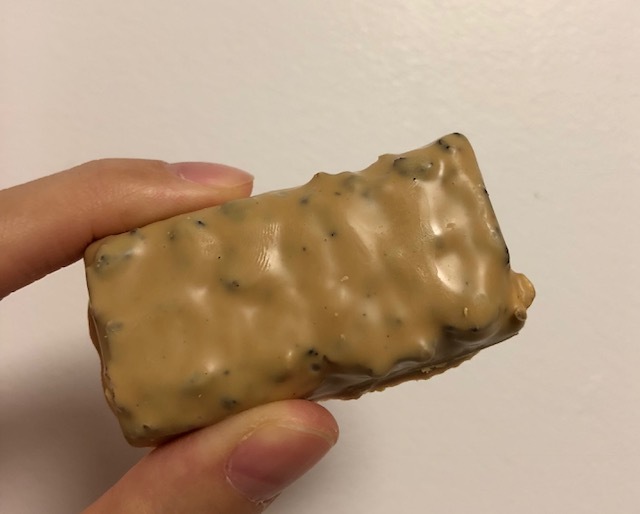 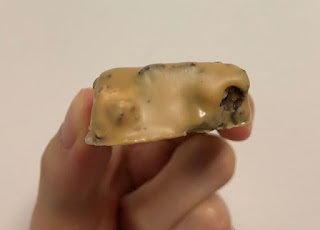 The chocolate was much paler than I though and it's creamy beige and the color reminded me of milk tea. 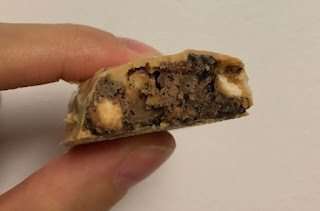 The chocolate coating was smooth and had subtle caramel flavor, and there're crunchy biscuits and cocoa cookies. 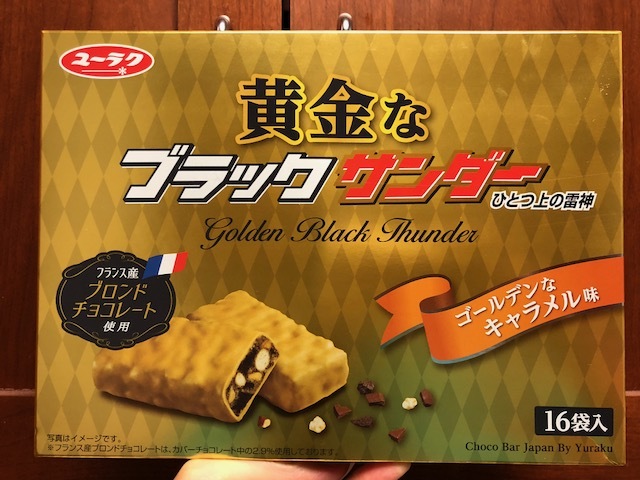 Chocolate flavor was overpowering caramel flavor, but still it's quite good and I wish they had it as regular Black Thunder flavor. 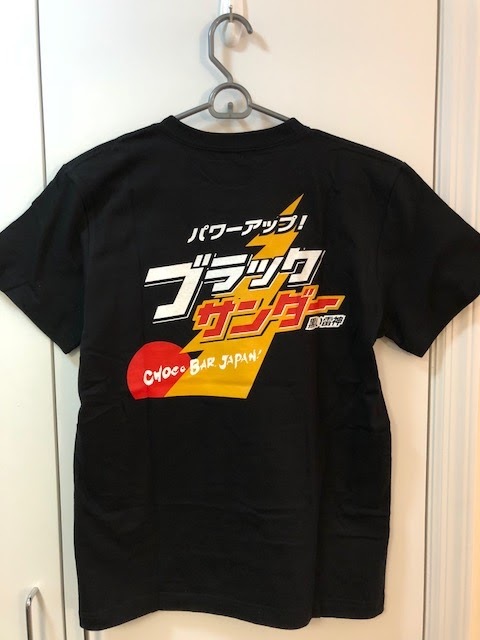 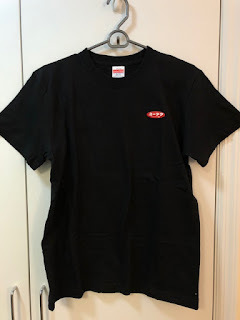 My husband also got me Black Thunder T-shirt.